College of Education Dean Thomas Koballa, Ph.D. (left) is pictured with Jacob Baxter. Department of Middle Grades and Secondary Education Chair Amee Adkins, Ph.D. (left) is pictured with Jennifer Fortney. Department of Elementary and Special Education Chair John Hobe, Ed.D. (left) is pictured with Mitchell Sexton. College of Education (COE) majors were recognized during the Georgia Southern University Armstrong Campus Awards Convocation ceremony held April 19 to recognize outstanding student achievement for the 2017-2018 school year. 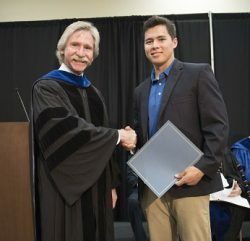 COE Dean Thomas R. Koballa, Ph.D. presented the College of Education Dean’s Award to Jacob Baxter. A senior health and physical education major, Baxter is commissioned as a Second Lieutenant for the Georgia National Guard. The annual Dean’s Award if given to an outstanding student in the College who has excelled in academic achievement, scholarship and service while also demonstrating leadership. 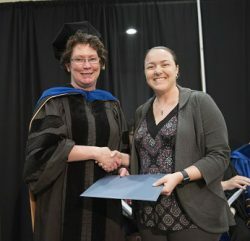 Amee Adkins, Ph.D., chair of the Department of Middle Grades and Secondary Education, presented both the undergraduate and graduate Outstanding Student Awards for the Department. The undergraduate recipient, Jennifer Fortney, is majoring in secondary science education. The graduate recognition was awarded to M.Ed. Curriculum and Instruction candidate Emily Freeman. John Hobe, Ed.D., chair of the Department of Elementary and Special Education, presented the undergraduate and graduate recognitions for the Outstanding Student Awards in the Department. “His precise planning and classroom management will create classroom environments where students will engage with Rayshawn and other students in the class for high level learning activities,” Hobe added. 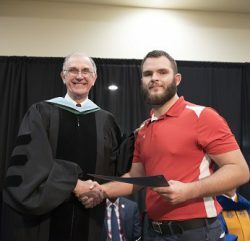 The Department’s Outstanding Graduate Student Award was awarded to Mitchell Sexton, who is completing a master’s in reading on the Armstrong Campus. Hobe explained that Sexton is innovative in his thinking and research for the education field.